intelligence and speed while the robots negotiate a specified maze. A robot participating in this contest is termed a micromouse. by the operator during the contest. It is however permissible to make minor repairs. 1-3. No part of the micromouse should be left in the maze. changes during the course of the run. There are no restrictions on the height of a micromouse. 2. Rules for the Maze. 2-1. The sides of the maze walls shall be white, and the top of the walls shall be red. 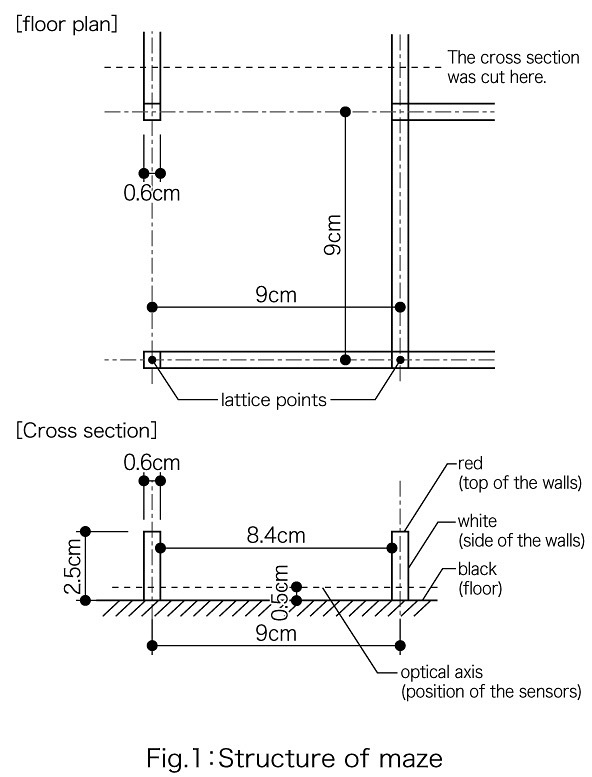 squares will be 2.5 cm in height and 0.6 cm in thickness (see Fig. 1 for details). 2-3. The starting point of the maze will be located at one of the four corners of the maze. x-y coordinates of the entry point to the finish zone. by exterior walls (see Figs. 1 and 2). 3. Rules for the contest. it partially by operating a switch, etc., during the contest. the starting point, stops for more than 2 seconds, or is approved to discontinue its run. the micromouse must first stop for at least two seconds at the starting point. tournament committee chairperson to do so or is given permission to discontinue the run. all memory of the maze is erased. body (defined as its portion up to 2.5 cm above the floor level) has entered the finish zone. be those of an ambient environment. Requests to adjust the illumination shall no be accepted. reserves the right to stop a run, declare disqualification, or give instructions as he deems appropriate. 3-10. Prizes and evaluation criteria will be set forth individually for each competition. 1. The contestant is not permitted to load programs or replace ROM during a contest. 2. The contestant is permitted to remove dust and debris on the tires during a contest using adhesive tape, etc. ; however, no solvents and the like may be used for the purpose of increasing friction. 3. In each of its runs, a micromouse may continue its probing even after it has reached the destination. 4. If a micromouse returns to the starting point and begins another run within two seconds, it is assumed that the next run has begun. However, this run will be considered invalid. 5. The micromouse may not be placed for adjustment or other purposes in any part of the maze other than on the square designated as the starting point except for during an official run. The size of the lower structure of a micromouse is constrained by the size of the maze notwithstanding the provisions of Article 1-5. The precision with which the maze is made is that commonly used for similar structures, and there may be an element of error in the dimensions. As the maze is designed to be flexible, the design may produce gaps or difference in level of approximately 1 mm between sections of the walls or the floor. There are also nonuniform color, discoloring and smear. Type: Transmission infrared sensors with horizontal Optical axis 1 cm above the floor. (See Fig.1) Position: Start sensor: At the boundary between the starting unit square and the next unit square. 9. The exterior walls of the starting point (outside the maze) and the interior walls of the finish zone are painted red. The top of the walls in the starting unit square and finish zone is painted white. 10. A goal marker may be placed at some point in the finish zone. It may also be removed subject to the approval of the tournament committee chairperson. 1. Competition consists of preliminary and final rounds. The number of mice that pass the preliminaries will be announced later. 2. The overall size of the maze and the location of the entry point to the finish zone (the x-y coordinates) will be announced two months before the contest, in principle. 3. The time limit will be announced about two months before the contest. There is no limit as to the number of mice that one party can register for this contest. However, only one mouse may take part in the final round (if more than one mouse is registered by the same person or if more than one mouse exhibiting technical similarities is designed by the same group). It should be noted that an operator (as a general rule, the designer is the operator of the mouse) is allowed to operate only one mouse during the final round. 5. Contestants are, without exception, not allowed to change batteries during a contest. 6. Lighting conditions and the use of flashes for photography in the arena. of robots that function only in controlled environments. In line with the above spirit, the competitions will be held under regular lighting as provided by the arena. to come up with measures to successfully cope with infrared rays. 7. For the final round, the secretariat will keep the robots at a designated location before the game begins and until the game is over. Before his/her turn, each operator must receive his/her own robot at the designated area, have the robot complete its runs, and return it to the same place after runs are completed. If 10 or more mice compete in the half-size category of a local or student contest held during this fiscal year, one mouse from each such contest will, upon recommendation, be entitled to enter the final round of the nationwide Half-size Micromouse Contest. 1st Prize - 6th Prize Awards given to the top six contestants with the shortest running time. Search Prize Evaluation based on the number of steps required before the mouse reaches the goal during the first run. New Technology Prize Evaluation based on the willingness to incorporate new technical elements and concepts that effectively opened up technological horizons. Superior Prize Evaluations based on the shortest running time and other aspects of performance particularly in the category of mice produced independently by high school students or younger. NAMCO BANDAI Prize An award given to the mouse whose unique technical elements and concepts were the most exciting and which had the deepest impact on viewers. Special Prize The mouse that has noticeable features other than the evaluation items listed above. * The foundation may limit the eligibility for awards to only one robot that achieves the highest score among robots demonstrating technologically similar characteristics created by a single group. * All award recipients will receive special souvenirs. All contestants will receive a prize for participation. © 2010 New Technology Foundation , All Rights Reserved.